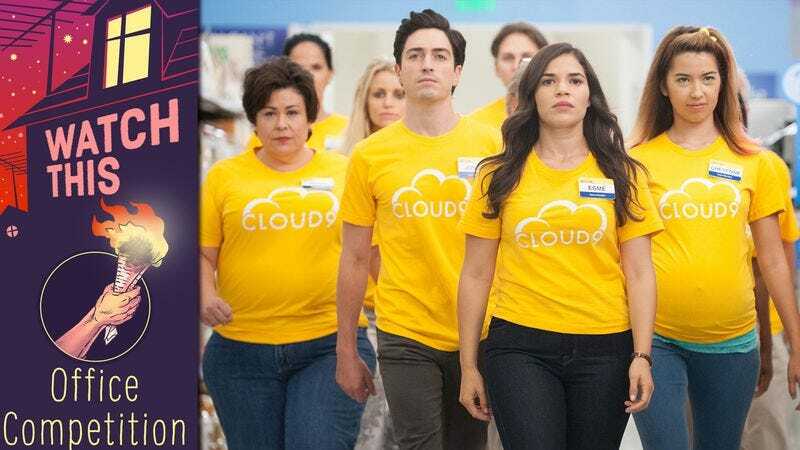 Superstore, NBC’s America Ferrera and Ben Feldman-starring sitcom, was one of last year’s secret gems. A straightforward workplace comedy, the series has a lot of fun with its simple premise, elevated by the comedic prowess and infectious energy of its two leads. Superstore wills its fluorescent world of big-box retail with characters who transcend their respective types, and while the humor is over-the-top, the character work is subtle and carefully laid out. Superstore doesn’t try too hard to be noticed. It’s just focused on playing to its strengths and churning out unembellished, relatable humor with a tinge of surrealism. The first season really hits its stride right around “Color Wars,” which perfectly embodies Superstore’s quirks. The episode adheres to Superstore’s modus operandi of taking a familiar sitcom plot and mining it for gold—or, in this case, red and gold. Glenn (Mark McKinney)—Cloud 9’s overly earnest and overly zealous store manager—divides the employees into the Red Team and the Gold Team for the store’s annual Color Wars. The team that makes the most sales gets a pizza party which, he points out several times, means something much more exciting than just pizza. But when Amy (Ferrera) finds out that the winners also get $100, the competition quickly heats up, and in true Cloud 9 fashion, everything spins out of control. While Superstore often plays around with rather heavy-handed jokes, when it comes to character development, the series is remarkably measured. “Color Wars” marks the first episode to really get into the complexities of Amy’s home life, the shortcomings of her marriage, and the circumstances that brought her to Cloud 9, and it does so just beneath the surface of the episode’s plot. The competition allows for plenty of fun and Superstore’s signature visual gags between scenes, but there’s a lot more stirring beneath it all. When Feldman’s Jonah first arrives as the new kid at Cloud 9, he repeatedly learns that there’s more to people than meets the eye. It’s a simple lesson for a workplace sitcom to espouse, but Superstore makes human depth a part of its DNA in a meaningful and smart way. The setting is confined to the brightly lit yet undeniably dismal walls of Cloud 9, but these characters exist as more than just cogs in the narrative machine. “Color Wars” has plenty of the retail-specific jokes that root Superstore in its setting, but its best humor—as is the case for every episode of the show—comes from the relationship dynamics and real emotions at play. Ferrera gives an incredible performance—funny and sad all at once—in the episode’s final seconds without overplaying it. And this all comes from an episode centered on office competition—a premise almost every workplace sitcom has tackled at some point. But Superstore does more than just make up another ridiculous and specific office Olympics. Just as Jonah has to learn about his fellow employees, with Superstore, there’s always more than meets the eye. Availability: Superstore is available for streaming on Hulu and NBC.com and is available for digital purchase.